Celebrate and support Great Britain in style, with the new Best Of British Collection from PANDORA. 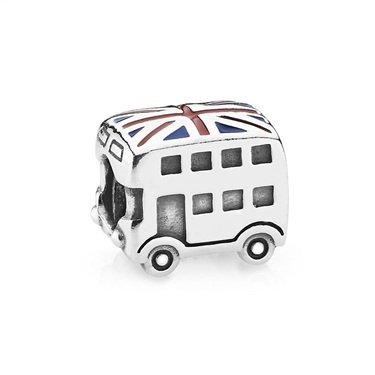 This quirky London double-decker bus charm is hand crafted from 925 sterling silver and is finished with a signature red, white and blue enamelled Union Jack roof. Mix and match your PANDORA charms for a look that is unique to you and wear your British inspired charms with pride. A well deserved 5* service. Ordering and check out was very simple and the shipping was super fast. Some company's charge a huge amount for shipping but this was very reasonable indeed. Love my charm. Thank you for making my first purchase a pleasant one. I bought this item for my daughter's 41st birthday. Although it took a bit longer than expected to arrive, when it did it arrive it was worth the wait. It was very well boxed and wrapped. My daughter was over the moon with the charm and when her friends saw it they all said they wanted one too.! Purchased as a present for my sister. I had tried to get one from your shops and the Pandora shop in Nottm and everyone had sold out, so I was so pleased to receive an email from you, and found you had it back in stop. Really nice charm. Excellent delivery, easy to use site. Thank you. Absolutely brilliant - her words, not mine! I had it sent to her grandmothers in England as I wasn't going to be able to get home from the U.S. this year, and I knew she had started collecting Pandora. She absolutely loved it, I couldn't have done better! A lovely charm. I wanted something english to represent the jubilee and olympics and this bus does both. The union jack colours are vibrant. Once angain fab service from Argento and speedy delivery. I was so glad to get this charm online to add to my collection of beads, it looks well on my bracelet and I was happy with the price,layout of the website and how fast the postage was. great thanks again. Argento's customer service is wonderful. It was perhaps unfortunate that they needed it - the package which the charm arrived in had not been sealed before dispatch, and the charm was missing. However, they sent a replacement virtually by return of post. 10/10 for customer service, 0/10 for Quality Control. Again Argento have scored a triumph. Delivered promptly and just what I wanted as it is a gift to a friend for her birthday. Thank you, I will continue shopping with your site. Beautiful detailed bus with vibrant Union Jack on roof. Delightful for all ages as this was a gift for a 78 year old; a 40 something and a 13 year old!! Have bought this charm for my daughters birthday. Am extremely pleased with the service, quick delivery and the quality of the item. I love this quirky charm. A fitting reminder of the London 2012 Olympics and Diamond Jubilee celebrations all rolled into one. Perfect Gift for my step-daughter who recently passed her PSV but also loves all things Pandora, A winning combination!